Teach Kids About the Stock Market | The Secret Formula! This innovative approach will get them started. Click on image for Cramer's take on one share of stock for kids. 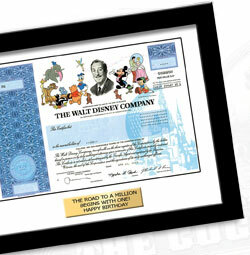 Let them experience true ownership of a company they love! The recipient becomes a real shareholder entitled to declared dividends, annual reports, invites to shareholder meetings etc. Each mailing from THEIR company is a learning opportunity. Buy in 1 minute with a credit card. 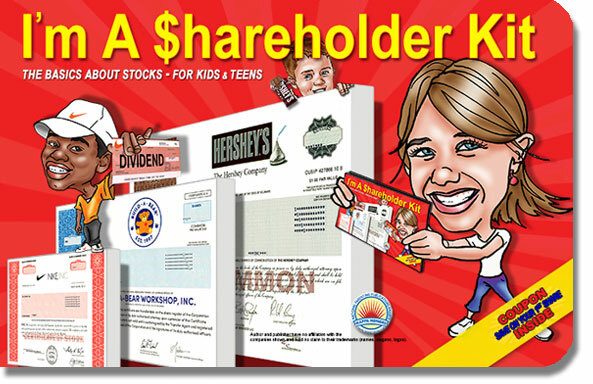 Step 1: Help your child/teen buy a share of stock in a fun company that they love (start here). Step 2: Add the award winning "I'm A Shareholder" KIT. This kit, along with the experiences that come with true stock ownership form a powerful tool that teaches skills that will benefit a child for a lifetime! Teaches K-12 the basics about money and stocks. 43 vividly colored pages | eye-catching graphics | fun facts | activities. Comes with a coupon for $20 OFF their 1st share of stock. Schools & teachers of financial literacy - contact us for special pricing.